Looking for a dishwasher for a streamlined kitchen where appliances won't be on show? Turn your attention to integrated dishwashers, which are hidden behind cabinet doors so that you can get either a sleek, contemporary finish for your kitchen – or an authentic look in a traditional-style room. We’ve rounded up a list of the best integrated dishwashers, while considering all styles of kitchen and budget options. So throw your rubber gloves in the bin and treat yourself. If you're looking for more kitchen appliance recommendations, head over to our hub page. Apart from getting you out of the washing up, modern, energy efficient models can help cut your household bills, and they give you a place to store your dirty dishes so that your kitchen always looks squeaky clean. The majority of dishwashers made as freestanding units are usually no wider than 60cm and stand a little below your kitchen countertop level. If you’re looking to save space or want to keep a certain aesthetic appeal to your kitchen, integrated dishwashers are designed to sit behind a façade that matches your kitchen cupboards. If you have a particularly small kitchen, you can also get slimline dishwashers that are a fraction of the width. See our pick of the best freestanding dishwashers. You can pretty much pop anything in a dishwasher these days, but make sure you check the capacity and the amount of space on the racks available. Some come with adjustable racks and prongs so you can fit in larger items when needed, but some don't. Many people don’t like to put glass in the dishwasher, but they normally clean well on the top shelf, and some dishwashers have special settings to ensure a more delicate wash. It's worth noting if the dishwasher you're eyeing up has a quick wash option, and how long it takes. It's also handy to know how many speed settings the dishwasher has as this can be useful for those who own nice kitchenware that needs to be delicately washed, or for those who like to use an Eco-Wash programme. Mostly beneficial for those who have younger children and don't want to risk waking them up or those who live in a flat, it's worth thinking about the noise of the dishwasher, or if there's a quiet programme. Energy ratings go from a D to a A+++, with most being very highly efficient. Most dishwashers will also come with an Eco-Wash setting, which takes a little longer, but every little helps. The cost of a dishwasher can range from anything between £200 and £1,000, depending on its capacity and energy rating. Wash up to 176 items in one load thanks to the Hoover HDI 3DO623D. Featuring 16 place settings, 10 wash programmes and six temperatures to play around with, it has everything you need to get your crockery looking good as new. For those who are in a rush, there's a quick cycle which takes just 24 minutes, and for those who are eco-conscious, there's an Eco-Wash setting which takes 170 minutes. Not only does this machine have an energy rating of A+++, but it also boasts an impressively low noise level and a third drawer which is ideal for serving spoons, large knives and any other cooking utensils. The machine can also be controlled via an app on your phone, so you can turn it on during your lunchtime at work and it'll be clean for when you arrive home. The best part? Once the cycle is finished, the dishwasher will automatically open to allow your crockery to air dry. If you want all the bells and whistles included with your next dishwasher, opt for this Bosch model. Not only does it have eight automatic programmes to choose from, but the machine will adjust your water usage, water temperature and rinse time to suit the level of soiling. For those who like their dishes to be completely dry when they come out of the dishwasher, use the ExtraDry feature, and if you like to put your dishwasher on once the kids are tucked up in bed but don't want to risk waking them, use the Quiet Mark feature for ultra-silent cleaning. The TimeLight function will show the time remaining on the current wash through a fancy LED light projected onto the floor, and the OpenAssist function will let you open the dishwasher just by touching the front of the unit, meaning it's perfect for those who have handle-free kitchens (or if you just want to wow your guests). For those who find themselves using the EcoWash option regularly, this one takes 195 minutes. 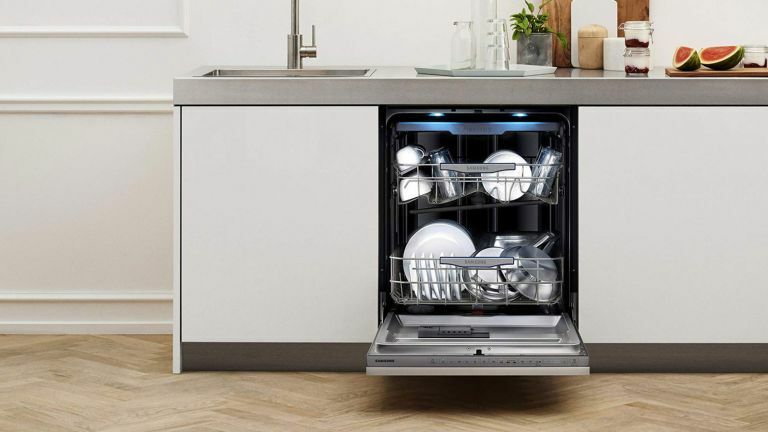 Say goodbye to standing at your sink and scrubbing dishes, as this budget-friendly integrated dishwasher by BEKO is your saving grace if you don't want to spend an arm and a leg getting your crockery clean. Not only does it come in just short of £400, but it has a pretty good energy rating, a rather low noise level and nine wash programmes to choose from. Thanks to the AquaIntense cleaning zone specifically for tough stains, you can throw your scourer in the bin, and the EverClean technology will ensure your dishwasher stays clean, even after all of the intense washes. Once your cycle's done, a red LED light will be projected onto the floor to let you know it's time to empty, and for those who always use the quick-wash setting, this one only takes 30 minutes. Our only complaint is that there's no time remaining indicator for when you're in a hurry or about to head out, but there is however, an oh-so-important wine glass basket built in to protect your fanciest of glasses. This is most definitely our pick of the best integrated dishwasher if you're on a budget. Perfect for a contemporary handleless kitchen, this model comes with door Open Assist – simply press lightly on the front and hey presto, it opens. Great for when your hands are full, but not as great for when there are kids running around. An ideal option for those who are after an integrated dishwasher but don't have the space, this slimline model certainly doesn't skimp on any features. The Flex 3 baskets and cutlery drawer have adaptable, foldable parts and the Chef 70˚C programme is great for removing stubborn stains from pots and pans. There are also special options for Extra Dry, Intensive Zone and VarioSpeed Plus that make this model stand out from the crowd. This fully integrated dishwasher is designed to fit in neatly with your kitchen’s décor and to save you space. With one of the highest energy efficient ratings a dishwasher can have, its quick power wash provides fantastic results in less than one hour. Arriving with a cutlery basket and FlexCare glass holders which ensure nothing gets broken during a cycle, you really can't go wrong. Although pricey, its sleek design and high energy rating make this a great investment for the modern home.